One hundred thousand years ago, acidic water began to dissolve rocks far below the surface of what is now eastern Nevada, eventually carving out a huge limestone cavern in the Great Basin. Ten thousand years ago, mountain glaciers across Nevada began to melt. Five thousand years ago, a seedling tree had just broken through the topsoil to bathe in the sunlight, and one of the deepest lakes ever known was beginning to form high atop a mountain 300 miles to the west. Four thousand years ago, a mountain of sand began moving across central Nevada and 3000 years ago, Native Americans were documenting their history on nearby rocks. Two hundred years ago, Europeans first discovered all of these treasures of the Great Basin and soon, Pony Express horses and riders were blazing trails across the mountains and desert to deliver mail. Before long, steel tracks were laid west to east as railroads pushed into the region; gold, silver and copper mines opened and closed as new mines were discovered. Settlements were built and grew into towns with strange names like Eureka and Ely as people began to inhabit the future state of Nevada. Today, across Nevada, evidence of all of these natural and cultural events remains. On the eastern border, Lehman Caves and a piece of that Pleistocene glacier sit high atop Wheeler Peak, where that self-same, ancient bristlecone pine is still alive and well. Along the western border, majestic Lake Tahoe is a major attraction for tourists and adventurers. Midway between, Sand Mountain continues to be reshaped by the wind, while the Pony Express station and trails, along with Indian petroglyphs, are still visible. In the town of Eureka, a structure built in the late 1800s is still in use and many others still stand. A 30-foot-wide strip of black asphalt known as U.S. Route 50 ties all of this 100,000 years of history together. Route 50 spans the U.S. from California to the Atlantic oceans, linking Sacramento, California to Ocean City, Maryland. Where this highway travels through Nevada -- between South Lake Tahoe on the western, California border, and Baker near the eastern, Utah border, it is often called "the loneliest road in America." I drove this lonely 400 miles over a three-day period starting at Great Basin National Park near Baker. I had come up from Las Vegas and stayed the first night in Ely, Nevada. It was late April, and there was still a lot of snow at the higher elevations. The best time to visit the park is in the summer when all of the roads to the top of 10,000-foot level of Wheeler Peek are open. 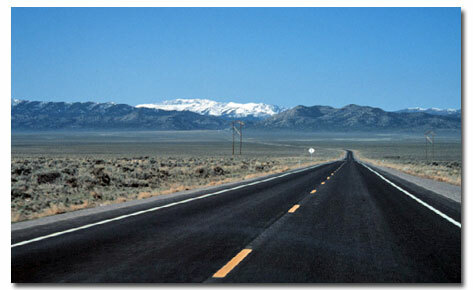 In fact, Route 50 is open year round and is in the high desert so the summer heat is not bad. After touring Lehman Caves and driving the road back into the forested area, around the 6,000-foot level, I headed back to Ely to spend the night and lose a few dollars in the slot machines. Ely is the closest large town to Great Basin National Park, a description of which can be found in our park page. The next morning I stopped at the BHP Copper Robinson Mines near the outside of town. The mining company has built an overlook of their operation, which is well worth the side trip. 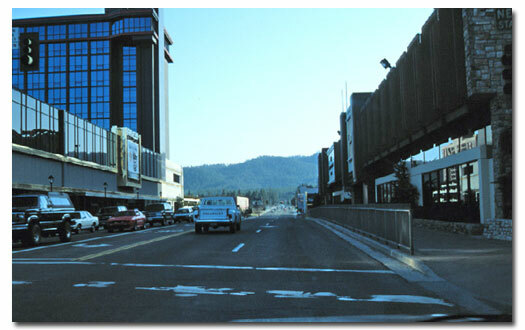 I then headed west along Route 50 to Eureka, about a 77-mile trip. When I arrived, I saw what is perhaps one of the best-preserved examples of 19'th century mining in the state of Nevada. I stopped for a few pictures and to explore the old mining town. My next stop along Route 50 was Hickison Summit, just east of Austin. 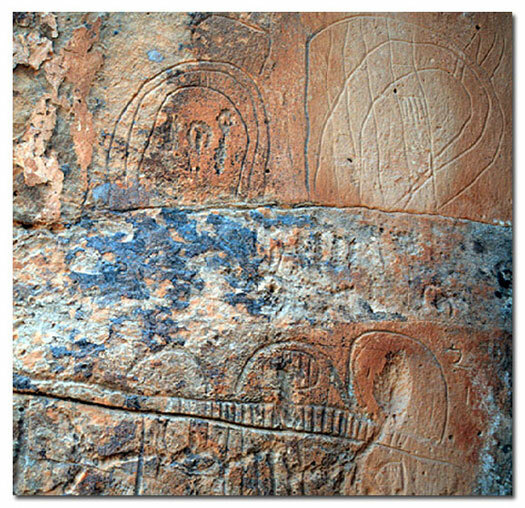 Here I viewed some unusual and rare Indian rock art dating to 1,000 BC. As I headed west again, I crossed a few of the old Pony Express trails that traverse the rugged terrain of Nevada and saw the remains of several stations near the highway. When I reached Sand Mountain, I also saw the remains of the stone walls from one of the larger stations, Sand Springs Pony Express Station, located in the area. 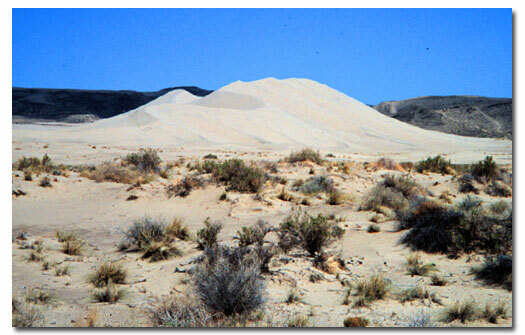 Part of Sand Mountain is preserved, while the rest is a popular recreation spot for off-road vehicles. Wind-blown sand from the ancient Lake Lahontan created the mountain of sand, and these same winds continue to reshape it every day. 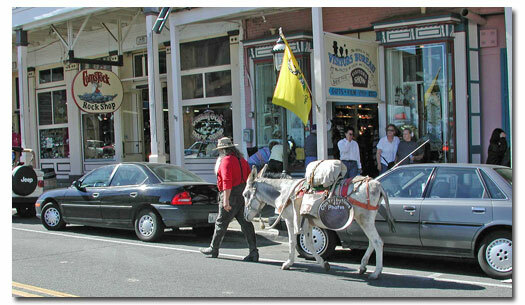 Near the western end of Nevada's Route 50 you can take a side trip to Virginia City, home of the famous Comstock Load. This silver mining town still has the look and feel of an old mining settlement, and the stores are stocked with a diverse selection of western goods and memorabilia. My final stop was South Lake Tahoe, where I stayed on the mini-strip of casinos that make up the last two blocks of Route 50 in Nevada. Lake Tahoe is a great place to visit in the summer as well as in the winter. There are plenty of things to do, both inside and outside – great skiing in the winter; biking, hiking and water sports during the summer. I was sad to leave Lake Tahoe, but I had to get back to work. My memories of Route 50, the loneliest highway in America, are good ones. I plan to return one day and spend more time exploring the many historic sites and points of interest.